"By moulding dogs to fit our own curious notions of canine beauty, we condemn many of them to chronic pain or ill-health through the propagation of inherited physical disorders (Wolfensohn, 1981). In various ways we also limit their ability to lead normal lives. By altering their height, the carriage of their ears and tail, and the length of their fur we prevent them from communicating effectively with each other. And although we indulge them in some respects, will still deny them the freedom to express much of their natural behaviour (Beck & Katcher, 1983)." From The Domestic Dog by James Serpell, Cambridge Univ Press, 1995. I admire the breeds of dog categorized by the Kennel Club as Toy breeds, they battle daily against a range of threats to their well-being: excessive coats, 'smashed faces', domed heads, short, usually bent, legs and over-abundant, ground-hugging jackets - exaggerations no captive animal should suffer. They have been exaggerated to suit human tastes not by nature. For me, they are victims of the infantile human desire to ensure they are warm-blooded accessories, not respected companion dogs. Howls of rage from their fanciers? Good! I would like to see a breeding programme, initiated by a kennel club somewhere, to improve their quality of life, bring ease of living and physical soundness into each breed and truly respect them as canine companions for us, their captors, masters and fate-deciders. Leave their welfare to an animal charity? I don't think so! We have a society created to prevent cruelty to animals, but they spend a great deal of money preventing cruelty to foxes and a great deal of their time prosecuting so-called 'dangerous dogs' without the knowledge to do so! Kennel clubs control the Breed Standards or word pictures of the breeds and that is where many a problem lies - with wording that is truly a 'danger to dogs'. 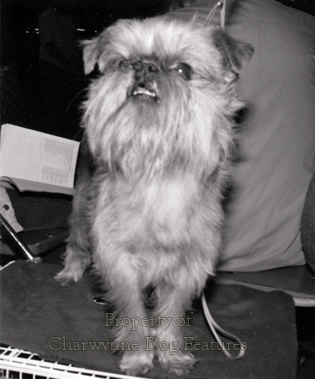 Here is some of the 'requirements'/guidance given to Toy breed fanciers in their Breed Standard: Affenpinscher - domed forehead, muzzle short and blunt. Griffon Bruxellois - head fairly large. Pug - head relatively large, muzzle relatively short, blunt. 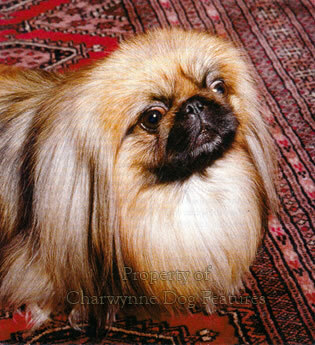 Pekingese - head fairly large, muzzle may be relatively short and wide, coat moderately long. King Charles Spaniel - skull large and well-domed. 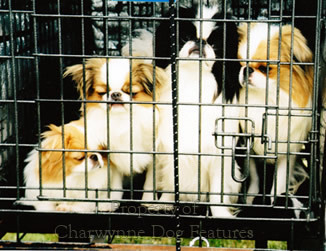 Japanese Chin - muzzle very short, size the daintier the better, must lift feet high when on the move. Italian Greyhound - a Greyhound in miniature, neck long, high stepping gait. Yorkshire Terrier - hair on body moderately long. The use of qualifying words such as moderately, relatively and fairly, gives the exaggerators all the leeway they need! Why does any dog need a large domed head? The hair on a Yorkie is excessive; no Greyhound has a high stepping gait so the Italian dwarf version cannot be like one; now; the Peke and the Pug just don't have muzzles! It was therefore no surprise to many of us, when in their 15th November 2015 issue, the Sunday Telegraph, under the headline: "Pedigree dogs abandoned after health is undermined by breeding" revealed that the number of Pugs left at Battersea Dogs Home has tripled in the past five years. Their problem? Breathing difficulties (and big vets' bills) from their intentionally shortened forefaces by breeders more wallet-led than welfare-motivated. 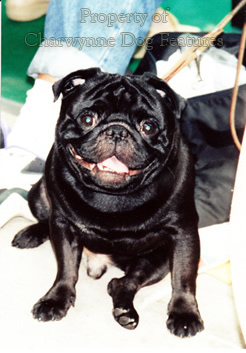 But you have to ask: "Do Pug breeders give a hoot about the health and well-being of their game little breed?" Sadly, it came as no surprise either when The Daily Telegraph, in their 22 September 2016 edition, published an article headed: "Stop buying bulldogs and pugs if you care about pets' welfare, warns vet chief". The sub-title of this piece read: "Fashion for flat-faced breeds linked to serious health problems including difficulty in breathing." The president of the British Veterinary Association is quoted as saying "The dogs (i.e. Pugs, Bulldogs, Shih-Tzus and Cavalier King Charles Spaniels) can suffer from a wide range of problems, including eye ulcers, spine abnormalities and severe breathing difficulties." Why is no breeder prosecuted for breeding dogs destined to suffer? The short-faced or brachycephalic head shape is the result of an inherited defect in development of the bones of the base of the skull; the skull is of normal width but is significantly reduced in length. The soft tissues of the head are not proportionately reduced, so too much tissue is crammed into the space available, leaving little space for the passage of air. The short face also imposes scenting limitations, with such a construction imposing a loss of 80% of scenting ability. With scenting power meaning as much to dog as sight to us, this is comparable to a loss of 80% of sight in a human being, some handicap. Eye problems occur in dogs with the short face; Boston Terriers can suffer from outward turning of the eyes, making it difficult to achieve binocular vision, as well as protrusion of the eyeballs, which can lead to their eyes popping out of their sockets, from even moderate trauma. The Pug, with shortened nasal passages, suffers from chronic sinusitis and other respiratory infections. Some Pug owners actually find their dog's snoring 'comforting'! 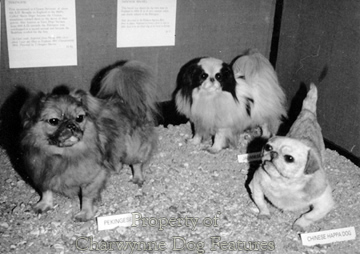 Breeding dogs for the psychological needs of humans is not very admirable but I've read of Pekingese owners liking the look of a permanently 'crying' pet and of pop-eyed breeds being desired because they look vulnerable, and they are! Eyeballs that protrude excessively expose the eye to drying, even difficulty in closing the eyes properly, and risking corneal injury. Too short a muzzle also leads to dental problems; the upper and lower jaws are not equal in length and the jaw is so short that the teeth are overcrowded. The short face also results in skin problems; deep folds or wrinkles around the nose attract bacterial infection, leading to surgical removal of some folds. Folds around the mouth tend to trap saliva and debris, causing at least a foul smell, at worst dermatitis. 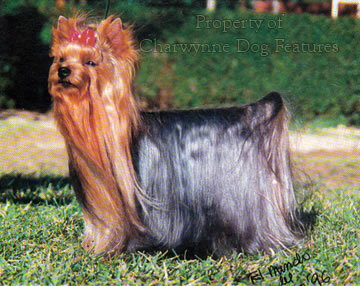 Take a look at the Yorkshire Terrier of today, compared to the early specimens in this spirited little breed. 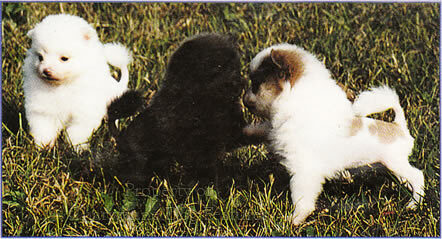 Small black and tan working dogs have been known in Yorkshire for several centuries. 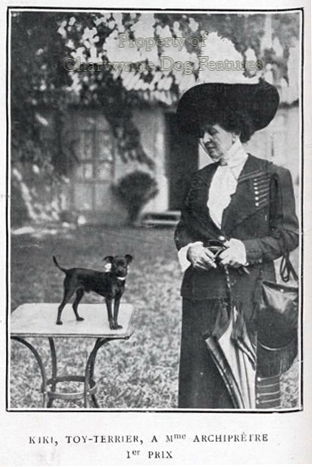 The little Halifax Terrier and the Yorkshire Heeler were commonplace before the advent of breeding for ‘the pedigree’. 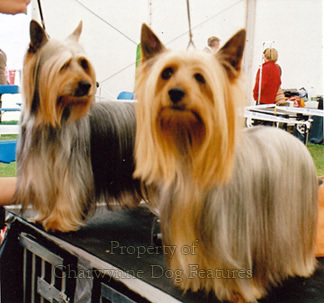 The latter breed has been lost, unlike the neighbouring Lancashire Heeler, whilst the former is perpetuated in the Yorkshire Terrier, the tiny ornamental breed of that name, in the Kennel Club’s Toy group. This modern show ‘terrier’ from Yorkshire is very much a manufactured breed, materialising around 1860. In time its devotees hijacked the breed name for the ornamental exhibitors’ type of seven pound dog and in due course, the Yorkshire Terrier Club was founded in 1898. 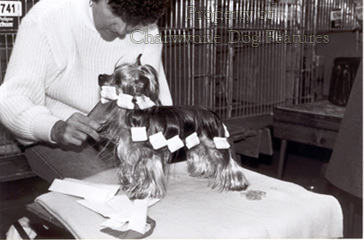 It is not historically accurate for a long-coated dwarf dog with a coat of such silky texture, so tiny physically and displayed with its topknot beribboned to be dubbed the ‘Yorkshire Terrier’. Originally, this dog was bigger and more robust, with specimens weighing from 10 to 14lbs, but 6lbs has been the weight of most of the bigger exhibits for the last century; today we see a wee scrap of a dog with a suppressed terrier spirit in a highly ornamental container. (I once watched a Yorkie being painstakingly 'groomed' for over an hour - and that was at a village dog show! This breed should be famous for its endurance). 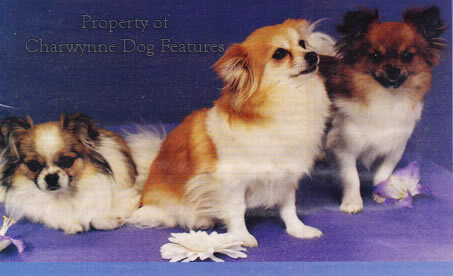 The Australian Silky is being bred and treated similarly. 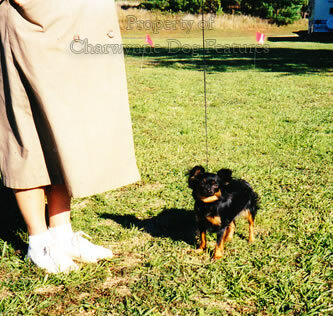 The dainty, diminutive English Toy Terrier, so tiny and fragile-looking and better-named the English Black and Tan Terrier (Miniature), is another case of fanciers reducing the size of the dog to suit their needs rather than those of the dog. To many non-specialists this little breed resembles the German Pinscher (Miniature), the smallest of the German smooth-haired terrier-type breeds, with the Dobermann Pinscher breed as the biggest form. In such a way could our charming Manchester Terrier be our English Black and Tan Terrier (Standard), emulating the varying forms of the Schnauzer. 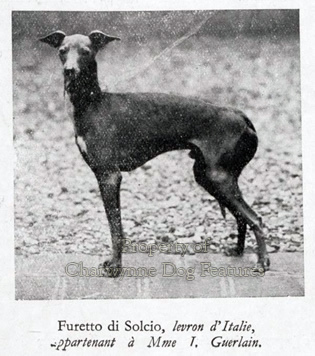 I see show specimens of the English Toy Terrier showing distinct signs of Italian Greyhound blood, especially in the hind-quarters. They have certainly ceased to be terrier-like, which is a pity, for a small terrier can make a great companion dog for flat-dwellers not seeking a grooming marathon. I can understand the 2011 Crufts judge of this breed writing: "I have been in this breed for over 20 years and have always exhibited and bred ETTs, however with the introduction of the American Toy Manchester Terriers - while adding a lot of qualities to this very old English breed, a lot of this breed's finer points have been lost." It would be good to see our KC and its Breed Club making more of a fight to conserve this breed, ideally in its original mould as a very small, but active and virile, dwarf terrier. A recast English small companion breed, perhaps dubbed the Mini-Manchie, might even outlast the sad little 'hand-bag' dogs now disgracing our streets! Meanwhile, in other countries, wallet-conscious breeders are lining their pockets with 'new' Toy breeds - in Russia the Moscow Toy Terrier, in the USA tiny dogs called My-kis and Munchkins. Dogs weighing under 4lbs are so vulnerable in busy city streets; are they allowed to live the life a dog would choose to live? BM Levinson, professor of psychology and the director of a child psychiatry unit, wrote thirty years ago: "I would like to state that in the year 2000, man will be able through the medium of pets to regain his sensitivity to events occurring in the animal world and to enhance his empathy with all living creatures. He will rediscover the semantic symbols which he used aeons ago to describe his emotions towards nature and towards pets. He will in a sense be a more complete human being." By respecting our dogs, which is more demanding than loving them, we become more rounded people, I am sure. Down the years, my dogs have taught me a lot about dogs and quite a lot about myself. I wanted them to respect me too.